Earlier this month, College Board released the 10th Annual AP Report to the Nation. Overall, it was good news: the total number of students taking an AP exam almost doubled over the past decade, and the number of low-income students taking the exams almost quadrupled in the same time period. By the numbers, this sounds great! However, on deeper examination we see that there is still a big problem our high schools are facing: an equity problem. Low-income students (defined for data’s sake as students eligible for free or reduced-price lunch) are not enrolling in AP courses (never mind taking AP exams) at the same rate as their higher-income peers. 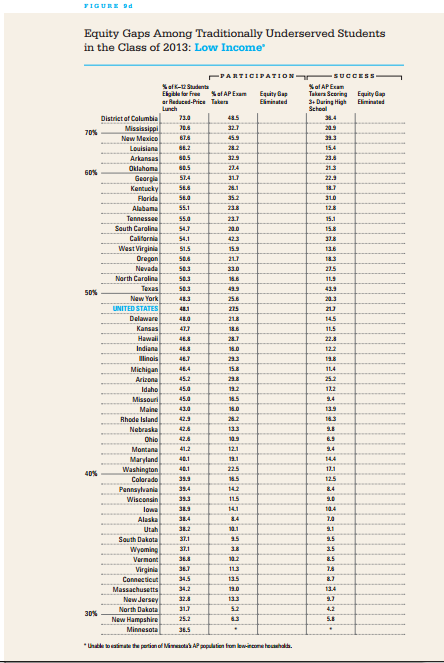 On page 27 of the report, College Board provides the reader with a chart of the states and a slot for a checkmark to designate whether a state has eliminated the equity gap. Guess what? Not one state is checked off. This data, buried toward the back of the report, should serve as a call to action for schools, partner organizations, and states to continue to provide low-income students with the same opportunities and support as their higher-income peers. Our Mass Insight Education AP program has made strides in this area: in 2012 and 2013, schools enrolled in our program represented approximately 22% of the state’s low-income 11th and 12th grade enrollment. Of those students, 37% achieved a 3, 4, or 5 on their AP exams. Initiatives such as ours, which focuses on providing all students the opportunity to enroll in AP, could have a major impact on closing the AP equity gap moving forward. In fact, African-American students in schools partnered in our program pass AP exams at the same rate that African-American students take AP exams in comparison schools. If enough states, districts, and partner organizations can see the value in AP for all as a part of a multipronged approach to school improvement, perhaps in one of the annual reports in the near future we’ll see a few checkmarks in the table above.